Tuesday July 5 – Brad Muirhead and Faculty Band- free noon concert @ Ladner Community Centre. Wednesday July 6 – Dr. Ed Orgill and Faculty Band- free noon concert @ Fisherman’s Hall, Ladner. 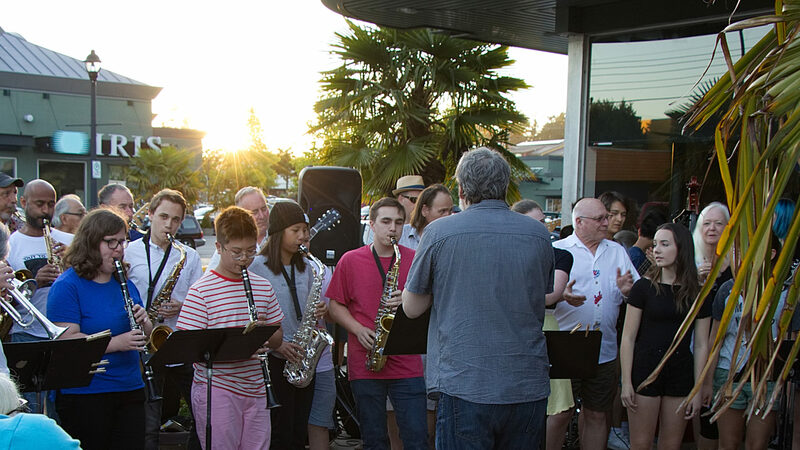 Wednesday July 6 – Jazz Workshop senior students @ Diefenbaker Park, Tsawwassen, 7pm. Thursday July 7 – Rob Kohler and Strings – free noon concert @ Ladner Community Centre. Thursday July 7 – Open Jam Session @ Petra’s Koffee Kafe in Tsawwassen, 7pm. Friday July 8 – Bill Clark and Faculty Band– free noon concert @ Ladner Community Centre. Friday July 8 – Art in the Garden @ Delta Community Music School, 1-4pm. Saturday July 9 – SDJF Student Concert and Picnic @ Delta Hospital Grounds – 12 noon – 3pm.